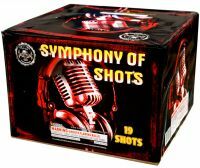 Symphony of Shots features green glittering mines to gold brocades, color mines to gold brocades, red glitter mines to gold brocades, and sea blue mines to gold brocades. 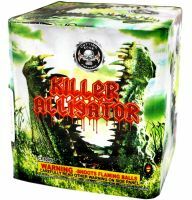 Killer Alligator fires 25 whistling silver tails that break loudly into large, multi-colored bursts. A fantastic item! 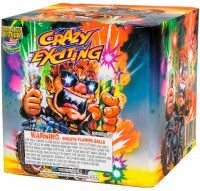 Crazy Exciting fires a 2-level effect. 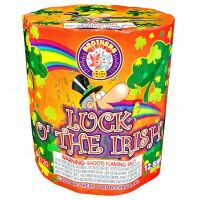 Each shot has a lower-level mine with color tips that fires up to a matching color break. The last round features a quick-paced volley of crackling mines to crackling breaks! 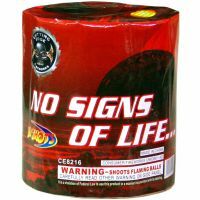 Robot Wars has 16 shots of red tails to red bursts with silver glitter, and red bursts with green glitter. 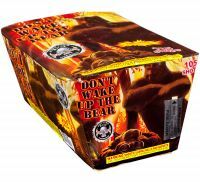 Don't Wake Up the Bear zips back and forth with a Z-shaped show of red, green, blue, white, yellow and purple comets with reports. This one has a great performance for the price! 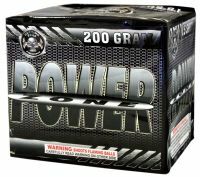 Power Zone packs a nice punch for a 200 gram sized multi-shot. 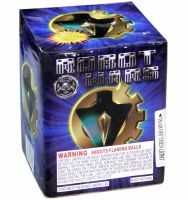 It fires in a fan-pattern, and has outstanding effects including: red and blue stars with white strobe; gold brocade crowns; purple and green stars with white strobe; red palm breaks with white strobe; sea-blue bursts and crackling chrysanthemums. 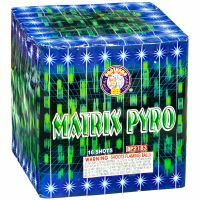 Matrix Pyro launches alternating red, green, and blue comet tails breaking into red, green, and blue-tipped gold willows! 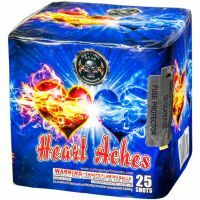 Heart Aches shoots crackling dragon tails that break into blue stars with gold crackle. It finishes with a fast-paced, 10 shot finale. 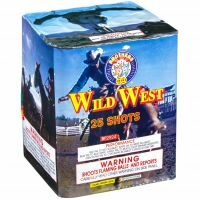 Wild West fires 5 volleys of 5 shots each! Each volley has a different color break in sky, finishing with gold crackle.